Adjustment line: this shows you where a pattern can be lengthened or shortened. Alter: this allows you change a pattern to fit a specific individual. Buttons: A cross will mark the spot where a button needs to be placed and a solid line indicates the length of the required buttonhole. Cutting layout: This is a map a showing how to fold the fabric and position the pieces which will vary with garment view, fabric width and pattern size. Cutting line: This is the outermost dark line marked with the size. Dots, squares and triangles: These indicate areas of construction where precise matching, clipping, gathering or stitching will be required. For Floral Cotton Poplin Fabric, visit http://www.higgsandhiggs.com/fabrics/cotton-poplin-fabric-112cm.html. Fold line: This is showing that a pattern piece needs to be placed on the fold of the fabric so that two identical halves are cut as one thus avoiding additional centre seams. Grain line: The grain lines is the suggested direction in which to place the pattern piece on the fabric with arrows parallel to the selvedge. Hem allowance: Quite simply, the amount of fabric allowed for the hemming. Line drawings: These show the shape and outline of the design plus any details such as seams and where the zip needs to be placed. Pattern layout: this is the diagram found on the instruction sheet, which indicates how to lay out the pattern pieces on the fabric. Seam line: This will be shown by a long broken line. These must be matched when putting the garment together for stitching and not the raw edges. 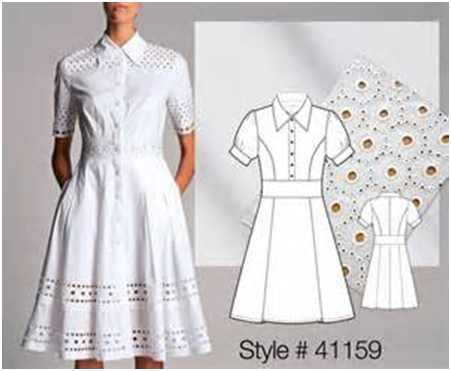 Views: Designs that appear on the paper patterns which show optional styles such as length, sleeve and hem variations. Back waist length: This is the measurement from the middle of most prominent bone at the base of the neck down to waistline. In-seam: The inside leg seam that runs from crotch to hem. Waistline: This is the thinnest part of your body. Bust line: This is the horizontal line running across the back and around the fullest part of the bust. It’s a very important measurement for correct pattern sizing. Hip point: This is the measurement from around the fullest part of your hips. If both waist and hip measurements are not included in the pattern then choose the pattern for hip measurement. If waist and hip measurements are not both included on the pattern – choose the pattern for the hip measurement.